The patient satisfaction questionnaire forms are initiated by the authority of a clinic or a hospital. There hospital authority seeks all the patients to fill out the form so that the management can analyze the value of their services and facilities. The hospitals wants to make a survey to make sure that the patients are getting all the benefits from the particular clinic. The applicant has to provide all the information which are required like whether the facilities are useful, whether the physician is capable of treating properly, whether the doctor is taking good care of the patient and many more. All the hospitals and medical care centres need to recognise the importance of the patient satisfaction. The opinion of the patients can hugely impact the business of the medical centres. 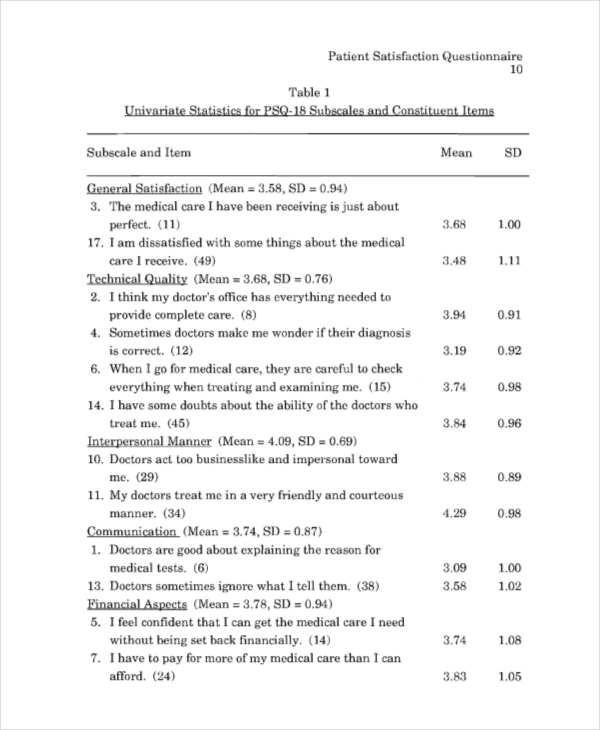 Therefore, the experts have come up with the unique idea of patient satisfaction forms. These forms are the smart and simple way to know whether the patients are getting the right treatment or not. These patient satisfaction forms include certain basic data which help to analyse every aspects of the services and benefits. 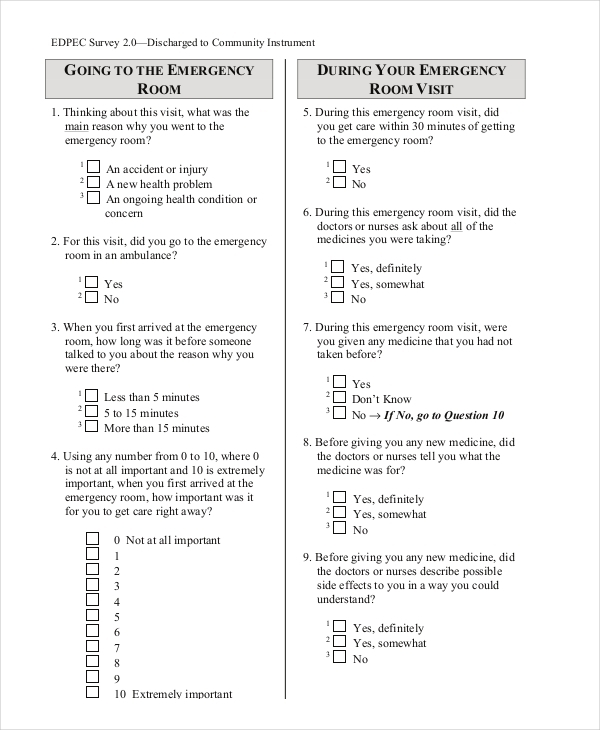 The patients have to answer certain questions via this form. For instances, the applicant has to convey whether the medical care he/she is receiving is perfect, whether the doctor is capable and compassionate, etc. The form is initiated by the St. Joseph’s General Hospital, Elliot Lake. The hospital management seeks to enhance the quality of their services and facilities. They want to provide all the patients with an integrated and world class health care system. The hospital management requests all the patients to fill out the patient satisfaction forms in order to describe their recent visits. The forms are designed in a way so that the anonymity of the applicant remains private. The patients have full freedom to share their real opinion about the health care providers via these forms. Every patient should take out a little time to fill out and submit these forms. This is an omr sheet form initiated by the Behavioral Health Services and affiliated by Group health. The form helps a lot to make a survey on the satisfaction level of the patients regarding the facilities and services of the health care programs. First of all, while filling out the form, an applicant has to mention the designation and the type of the specific practitioner who is treating him/her. After that, the patient needs to rate the treatment of the particular physician. The applicant has full right to express his/her real opinion by rating the physician. The motto of filling out this form is to share your overall experience of receiving the services of the health care organization. 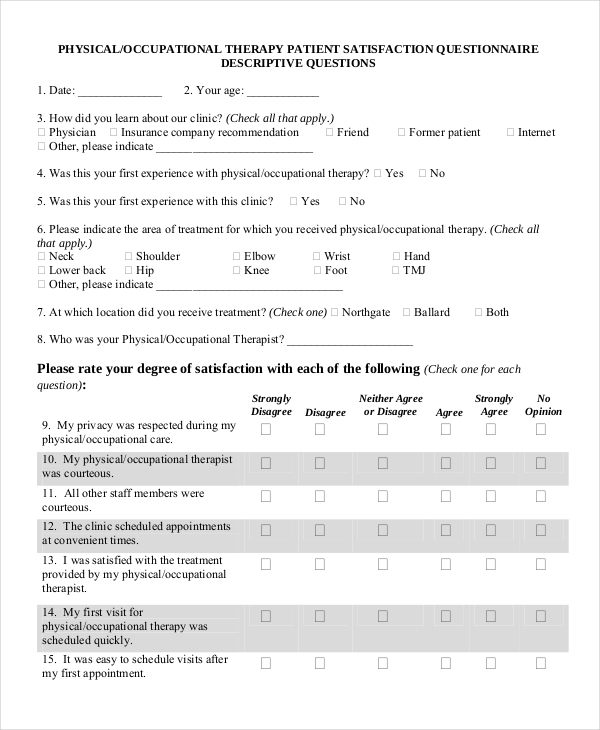 This kind of patient satisfaction questionnaire form is designed particularly for physical or occupational therapy. This form basically includes descriptive kinds of questions. The applicant has to convey the source which helps him/her to learn about the health care services. Next, the applicant has to give details of his/her injuries and the details of the treatment. He/she also has to provide details of the physician and his/her way of treatment and behaviour. Apart from the physician and treatments, the applicant also has to share his/her opinion about the staff members and the ambience of the medical clinic via this form. The Rand Corporation has come up with the idea of this specific patient satisfaction form. Rand Corporation is known to be a nonprofit organization which helps to improve the ability to make decision and effective strategies, by incorporating analysis and research. The patient satisfaction form is a way of doing such surveys. The questionnaire comes as a digital soft copy which is made by the public service department of the Rand Corporation. The survey is a part of the Rand corporation research report series. The reports of the particular organization present objective analysis and findings which convey the challenges faced by the private and the public sectors. All the reports of the Rand Corporation have been reviewed by experts who ensure the standard of the objectivity and quality. Waverley House Plastic Surgery Centre has introduced this particular kind of patient satisfaction questionnaire form. They distribute the forms among the patients once the surgery is done. The Waverley House Plastic Surgery Centre provides all the individuals with high class patient care which is well equipped with premium standard of facilities and services. The organization invites the patients to take out a little time to fill out the survey forms. These forms help a lot to get the feedbacks of the patients. These feedbacks help the hospital authority to improve their drawbacks and enrich the overall services. The hospital authority promises to maintain complete privacy of the patient’s identification. Therefore, the patient has the full freedom to share his/her opinion about the services of the hospitals. This is the patient satisfaction form provided by the Family Dental Health Centre. The medical center believes that the opinions of the patients are very important in order to analyze whether the hospital is providing good services or not. That is why, the management of the health care center requests the patients to fill out these forms carefully. The patients are welcome to share their real experience via this form. The patients will also understand that the hospital cares about them. These forms help a lot to build up the trust of the patients. Apart from the personal details, an applicant also has to give details about the dentist who treated him/her. The American Society of Anesthesiologists knows the value of analyzing and measuring the satisfaction level of all the patients. The members of the organization believe that the assessment of patient satisfaction and patient experience are the key points to measure the performance of the hospital. This is the best way to collect the data from the patients and the clients of the medical care center. 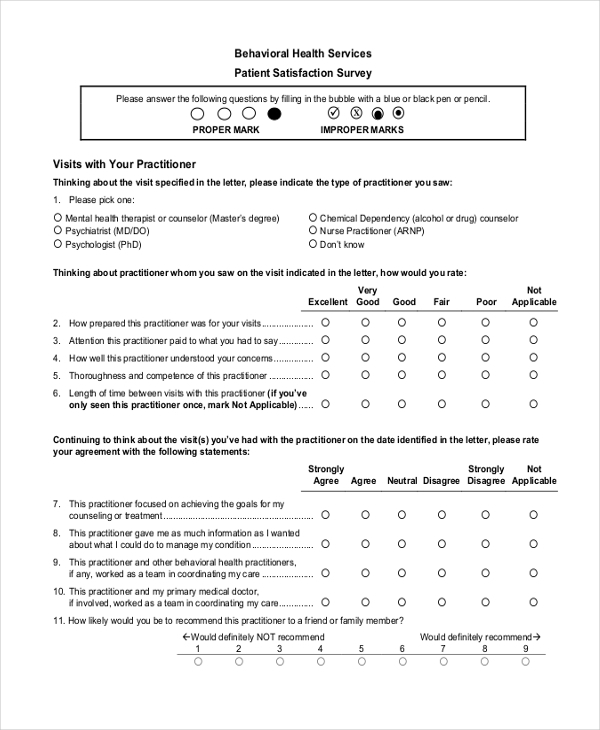 What is The Importance of Patient Satisfaction Forms? 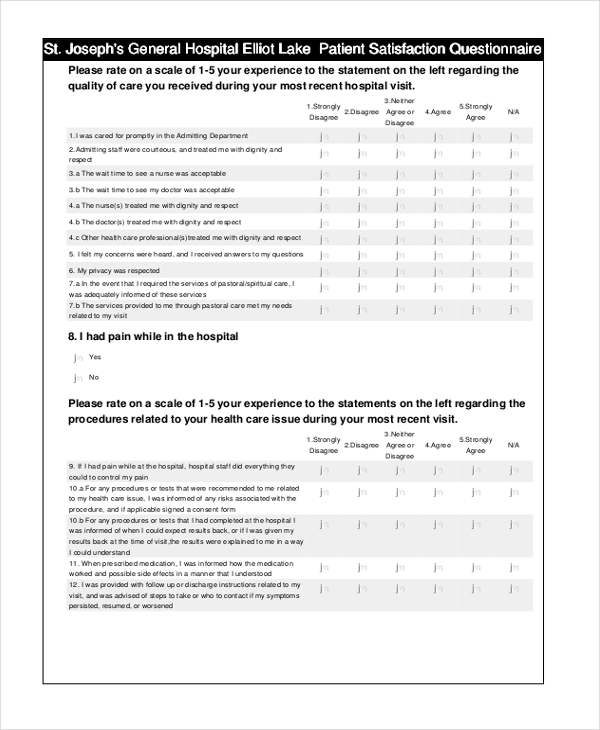 These surveys can help indicate the patient’s perception of the services and the facilities of the hospital. These surveys have huge importance when it comes to the business dealings and the reputation of the hospitals. Conducting these surveys at least once in a year is very important.